I don't know what it is, but this year I'm feeling especially festive, and I really want to make the most of the Christmas season. Usually, December whizzes by in the blink of an eye and before you know, opportunities to get festive have been and gone - this year, I want sequins and fairy lights and Christmassy cocktails, I want to make magical memories that we'll look back on for years to come. So to make sure I'm making the most of this most wonderful time of the year, I've created a checklist of things to do during December. 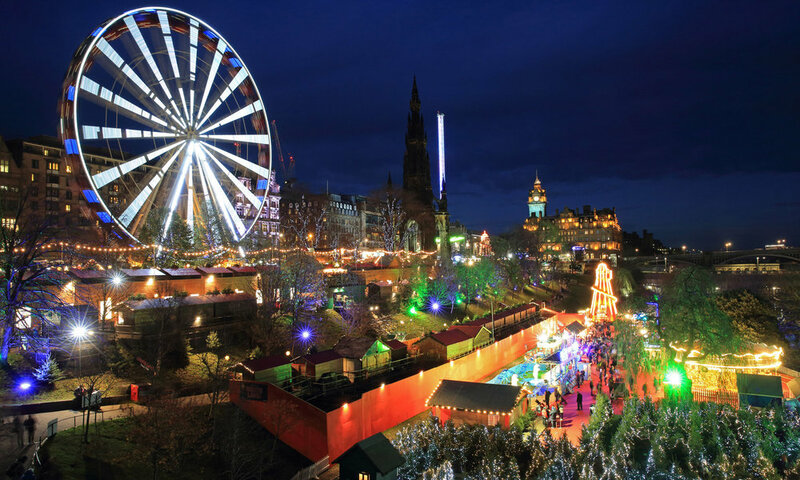 Some of is may be quite specific to Edinburgh, but wherever you live, there will be lots of festive fun to be had. Let's see how many of these we can tick off before the big day...! We love the Botanic Gardens in Edinburgh, it has lots of special memories for us, and this year we're hoping to go along one evening for their magical 'Christmas at The Botanics' lighting display. The entire gardens are illuminated to create something spectacularly festive; I can think of nothing nicer than bundling up all cosy and heading out to this! There are two official Christmas markets in Edinburgh this year: the Scottish Market and the German Market, both held in the city centre. I'm looking forward to heading along one evening after work with Lewis and picking up some delicious festive foodie treats, and possibly some little stocking fillers too. I didn't get to wear my Christmas jumper last year (it arrived promptly after the festivities had finished), so this year, it's getting an outing and that's that. We've never been for an official Christmas cocktail date and this year it's happening - we'll get all dressed up and go somewhere for something sparkly and boozy and deeply Christmassy, I cannot wait! Of course, you can't always go out whenever you want a cocktail, and this year, we have a perfectly lovely bar cart to put to use. Last Christmas was all about the Salted Caramel White Russian, and while that will absolutely be making a reappearance this year, I'm thinking that our signature festive drink will be a Gingerbread Martini. I rinse my Christmas playlist every December, so it's a good time to update it with anything new or anything we've accidentally left off the list. You can't decorate a tree, write Christmas cards, wrap gifts or make cocktails without the playlist on, and that's a fact. I am that person. I have no shame. We are desperately trying to make this happen this year, but it's tricky when our family is scattered across the country. We won't make it to London before Christmas, but we're going to get over to Glasgow and up to Aberdeen to visit family: my auntie has small children in Aberdeen and I am longing to give them their presents in person! We also have a planned family gathering here in Edinburgh so hopefully we should tick almost everybody off the list. Christmas is all about family, after all. This is one of my favourite parts of Christmas prep, I think I'm going to do this this weekend and I am so excited about it! I may or may not have already done this. I may or may not have already done this, in October. I think I've previously been ok at this, but for the first Christmas in our new home, I want to scatter the festive spirit throughout the whole place and not just limit it to the living room. I'm going to put the skills I learned from the Nikki Tibbles masterclass I went to recently, and buy some Christmas blooms to create some fabulous festive floral arrangements for the house. Much like family, Christmas is also all about being with friends. Again, our friends are scattered all over the place too, so I'm trying to arrange a few dates where we can all meet up or have people over, just to spend time together. If I haven't warbled my way through Last Christmas by December 24, something's gone very wrong. Lewis and I have never been ice-skating together and this year, I'd love to give it a go in the city's Christmas outdoor rink - although I know I am terrible at it. I will give the gift of laughter to my onlookers. It's an Edinburgh institution, and they have stollen ice cream. Enough said. Not just any hot chocolates - I'm thinking seriously extravagant, possibly boozy. I'm thinking all the classics: The Muppets' Christmas Carol, The Holiday, Love Actually (of course) - any other suggestions welcome! I mean all of those Christmas specials you only revisit once a year just to get that gorgeous glowy feeling (and admittedly you maybe sometimes watch them in July, if you need a little boost of cheer). It's time to revisit The Vicar of Dibley, Gavin & Stacey and all of the other UK Gold specials you can fit into your viewing schedule. I love the sound of this! The Biscuit Factory is (you guessed it) a former biscuit factory in Leith, and this year they're hosting a festive pop-up cinema, themed to be like an indoor winter wonderland (complete with outdoor winter temperatures), and showing a selection of fuzzy, family-friendly festive films along with delicious snacks and warming drinks. We've got tickets to see Harry Potter & The Goblet of Fire, natch, and I am so excited about this - it's so close to Christmas, I can barely think of anything more festive than the most Christmassy Harry Potter film (I mean, the Yule Ball, guys) in a pop-up cinema with a hot chocolate. This is something I try to do every year - for me, it's very important to remember those less fortunate, and remember that Christmas is a luxury that not everybody can afford to indulge in, even on a small scale. This year, I'm supporting the Cash For Kids Mission Christmas campaign, which donates presents to children who might not receive any otherwise. It's as small or as big a gesture as you want it to be, and I do urge you to get involved - maybe spend that £10 set aside for a cocktail on a gift for a child instead, it definitely feels better and really, in the end, that is truly what Christmas is about: loving and sharing, even with those you don't know.